Everyone knows Jekyll and Hyde, but I bet not many have actually read Robert Louis Stevenson's novella The Strange Case Of Dr Jekyll and Mr Hyde. That's with good reason: it's pretty damn boring. Readers in 1886 were blown away, but to modern audiences, the characters - especially the protagonist Mr Utterson - are straightlaced stuff-shirts, the epistolary style slows the pace to a crawl and the actual identity of Hyde is presented as twist when it's now too famous to surprise anyone. Give me a toe-tappin' pop opera adaptation any day. 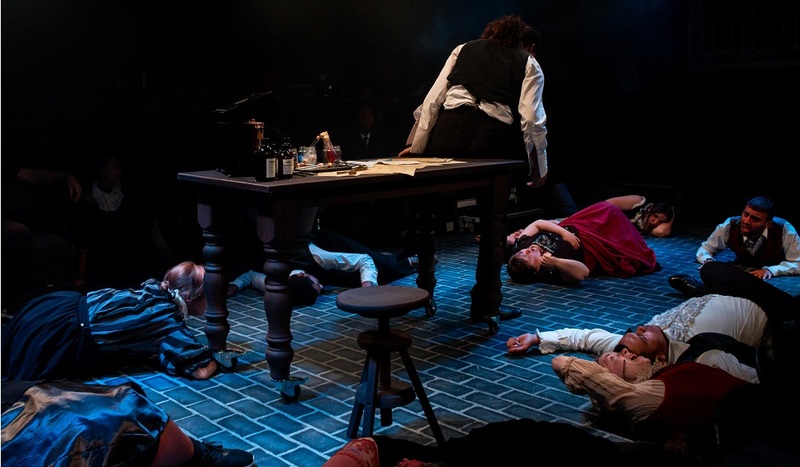 This is Chickenshed's Jekyll & Hyde, who take the story, run it through a London Dungeon style funhouse horror filter, pump in billowing clouds of dry ice, a bunch of pleasantly lurid lighting and has some fun with it. The tone is set even before the audience has had a chance to sit down. In a neat (and pretty original!) detail, the Victorian London stage design leaks out of the studio performance space and into the corridor, gradually easing you onto the cobbles of their foggy streets. Before the show begins, a hawker (Will Laurence - excellent throughout) hands out Penny Dreadfuls explaining the plot to the audience, bantering back and forth as he drums up business. I'm a big believer in first impressions and that you can tell whether a production is going to be good in the first couple of minutes. This all bodes well. When we're actually up and running it's clear what vibe director Jonny Morton and his team are going for: this is Jekyll & Hyde via Tim Burton's Sweeney Todd (or any number of cranked up Victorian caricatures). Even better, while I've seen some seriously plodding adaptations of this story in my time, this one doesn't mess about. The tale is told economically and quickly, skipping to and accentuating the exciting bits of gothic horror we all want to see. An early highlight is the 'Trampling of the Girl', in which the chorus watch from above as a cloaked, bestial figure has his way with 'Poverty's Child'. It's a neat sequence, followed by a well-choreographed dance in which her corpse is spookily paraded about the room - a real-life Penny Dreadful. But it's Jekyll/Hyde we're all here to see, and Nathaniel Leigertwood doesn't disappoint. There's a sense of manic compulsion to his Jekyll as he wrestles with the implications and freedom of Hyde. His Hammer Horror laboratory is stocked with vials of strange liquids, making the division between the composed and elegant man and his raving private life that much fiercer. Leigertwood absolutely nails the transformation sequences too, writhing and shuddering in dramatically - before becoming low, feral and simian, his hair raggedly hanging over his face. There's a real sense of danger as he prowls the stage, his voice lowered to a guttural growl. It's a real 'everything and the kitchen sink' kind of performance - and is key to the show working as well as it does. There are a couple of flies in the ointment. I wasn't a huge fan of some of the arrangements in the pre-recorded score, which occasionally sounded a bit like Casio keyboard presets. The melodies are great and there are a couple of brill hooks, but a more contemporary production would have been nice. In addition, there are a couple of vocal moments that are beyond the cast's capabilities, but I don't want to criticise an ambitious book too much. So colour me impressed. As the autumn nights draw in and the mercury steadily drops, you could do far worse than to stalk the foggy streets of Victorian London with Chickenshed. 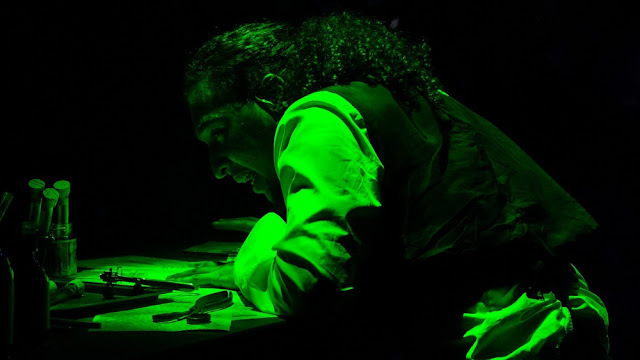 Jekyll & Hyde runs until 20 October at the Chickenshed Theatre. Tickets here.